Product prices and availability are accurate as of 2019-04-14 19:59:21 EDT and are subject to change. Any price and availability information displayed on http://www.amazon.com/ at the time of purchase will apply to the purchase of this product. MINGER PAR30 LED flood light bulbs provide 900 lumens of soft white, equivalent to 60-watt incandescents with 80% less energy use. These bulbs fit standard medium base (E27) fixtures and are ideal for recessed can style lights. 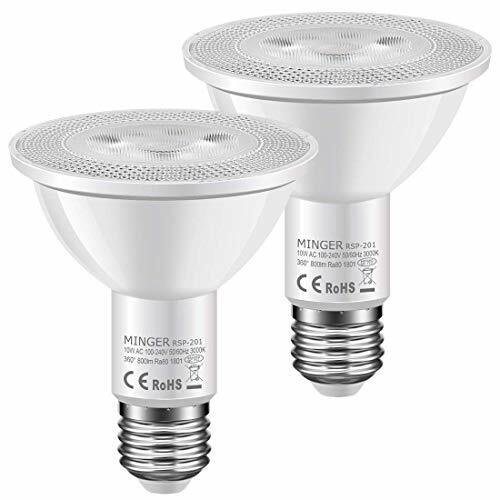 MINGER LEDs are mercury-free so they don't contribute to harmful hazardous waste. Each bulb is expected to deliver a lifetime of up to 30,000 hours, saving you the cost and hassle of frequent bulb replacement. [Energy Saving] Built-in photosensitive elements, automatic sensor control. 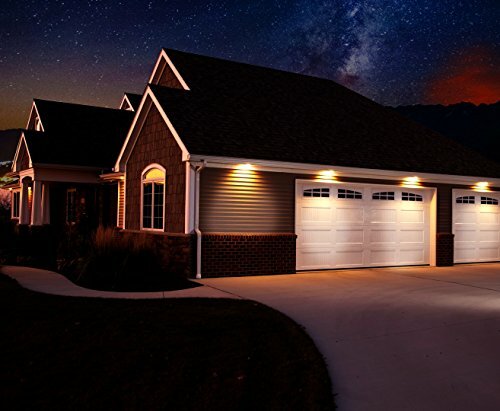 Save 80% of energy than traditional bulbs. 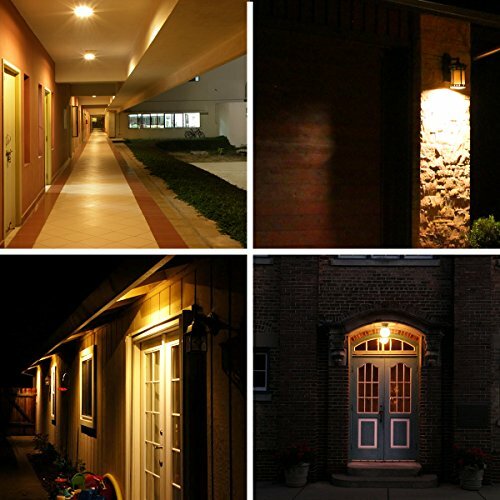 It automatically switches On at dusk and OFF at dawn.Replace a 60W traditional light bulb by a 10W LED. Turn off > 45Lux, turn on <15Lux. [High color rendering index] CRI80+. 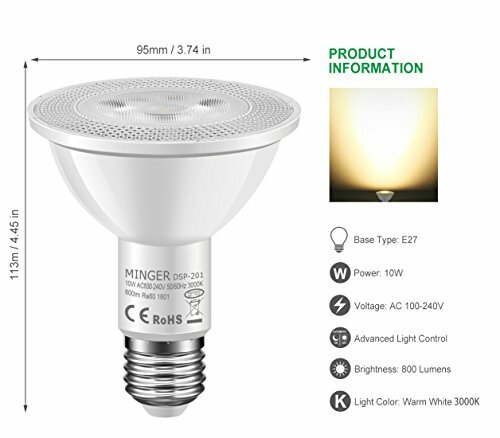 Minger's CRI80 technology delivers quality light close to the sunlight with a high degree of color reproduction for a true natural color in your home. 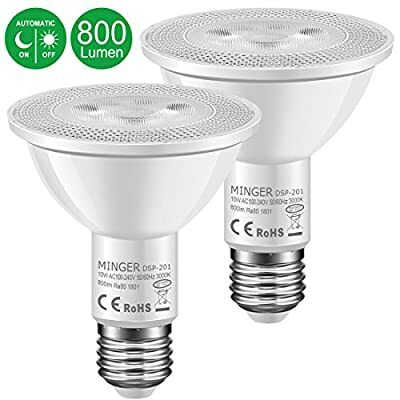 [Warm White 2700K] AC100-240V, 800lm. Light up your room and your mood. [High Quality LED Chip] Each bulb is with 32 SMD 2835. Bright, environmental friendly, wide voltage constant current power supply. Light brightness will not change. No radiation, no flicker, no electromagnetic waves, no harm to your health. 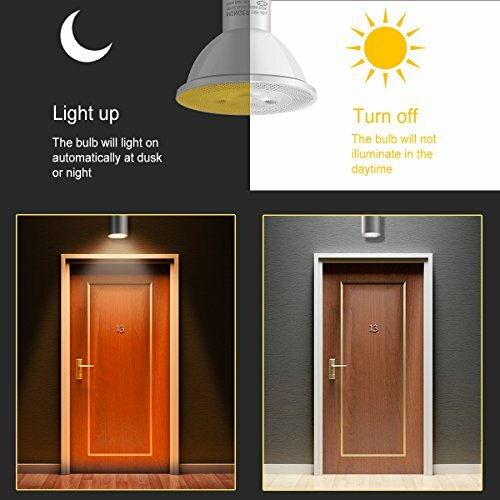 [Versatile Application] Widely used in the home indoor lighting, hotel, meeting room,, offices, hospital, schools, factories, museum, shopping malls, supermarkets, restaurants or any other places where accent lighting is required.